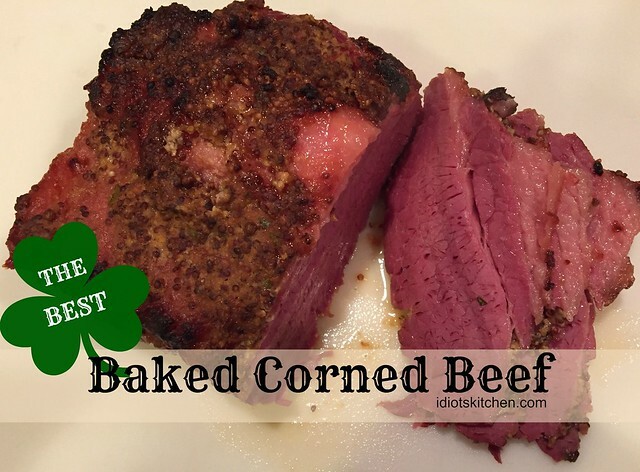 St. Patrick’s Day is right around the corner so now is the time to make THE BEST Baked Corned Beef! I am a big fan of corned beef and usually do a traditional Irish boiled dinner of Corned Beef & Cabbage with carrots and potatoes. 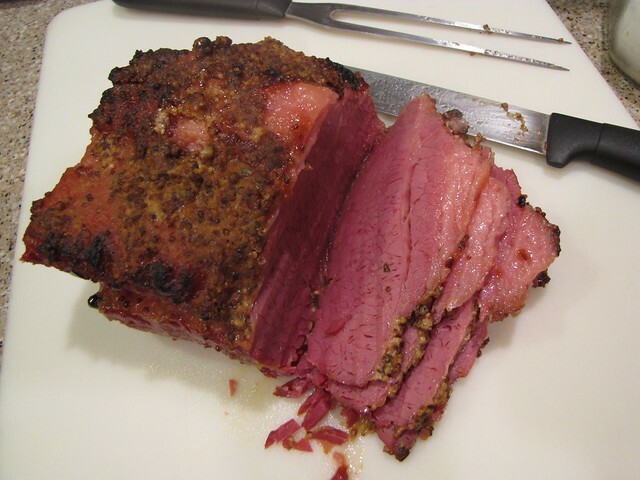 I’ve tried a couple of other methods (slow cooker with pickle juice was interesting and easy but not the best texture), so I was slightly wary when my friend Cody insisted that I try this recipe and bake the corned beef. But he was so right! I am here to say that hands down, this was THE BEST corned beef I’ve ever had. This is tender, flavorful, and super easy to make. However, if you’re scrolling down the recipe and wondering about the mustard and brown sugar topping, let me reassure you that the corned beef comes out tasting nothing like mustard or brown sugar. I think they really help offset the saltiness of the corned beef. I did a fully scientific study at dinner last week and baked 1/2 with the mustard coating and 1/2 plain. Guess which one was completely gone? No leftovers at all. Mustard and Brown Sugar coating for the win. This is a 5 pound corned beef brisket that I have cut in half for quicker cooking (and for our experiment). Most corned beef that you get at the store (and not at Costco) will be in the 2½-3 pound range. However, corned beef shrinks up like crazy when you cook it so I think a 3 pound corned beef would feed 4 people one serving each with no leftovers. Our 5 pound corned beef fed 4 hungry people with 2 small leftovers. Corned beef is GREAT leftover – Hello, Ruben Sandwiches! – so why not get a big one or buy 2 while they are on sale and cook them at the same time. 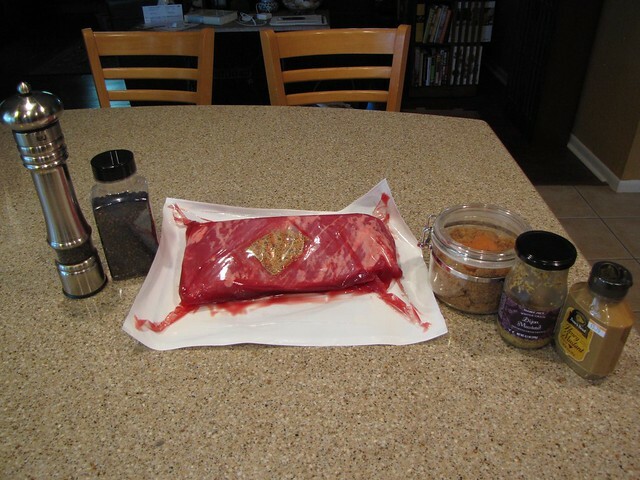 Remove the corned beef from the package and set aside the little packet of peppercorns and seasonings. Discard any liquid from the package. RINSE the corned beef under cool water to remove the slimy packing liquid and also to remove some of the super salty flavor. Pat the beef dry with paper towels. Sprinkle the contents of the little spice packet over the beef OR use plain peppercorns or coarsely ground black pepper. The little spice packet usually contains peppercorns, pickling spices, bay leaves, etc. so I like to use it as the seasoning for the meat. 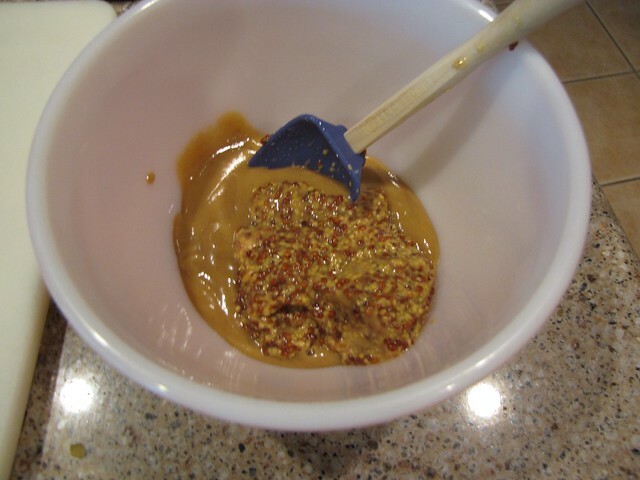 In a small bowl, combine ¼ cup whole grain mustard and ¼ cup honey mustard. Stir to combine. If you have a 2-3 pound corned beef, this is enough mustard to coat the top AND have some extra for serving. If you’re making the bigger, 5 pound corned beef, you will use all the mustard. You can make a little more for serving or set out a jar of spicy brown mustard. I found that this was so flavorful, that it didn’t need any extra mustard at the table. 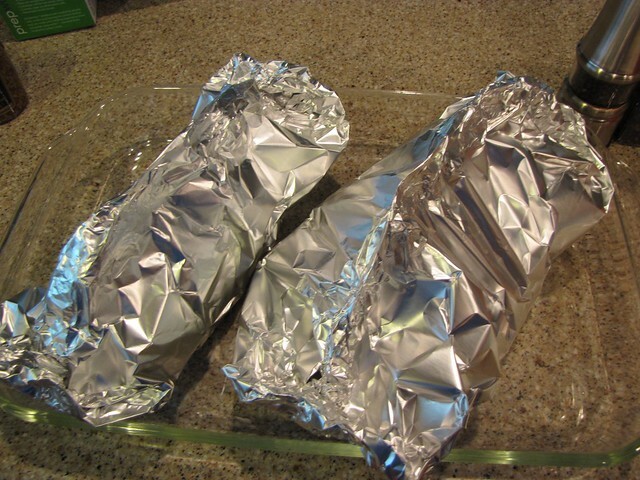 Place your corned beef on a large sheet of extra heavy duty aluminum foil with the fat side facing up. Spread the mustard mixture over the meat and then sprinkle with 2 Tablespoons of brown sugar. You will need to increase the sugar to 3-4 Tablespoons for a bigger piece of meat. Loosly wrap up the corned beef leaving a large air pocket on top. Be sure the foil is sealed really well to keep all the juices in the packet while cooking. There should be space between the beef and the top of the foil. 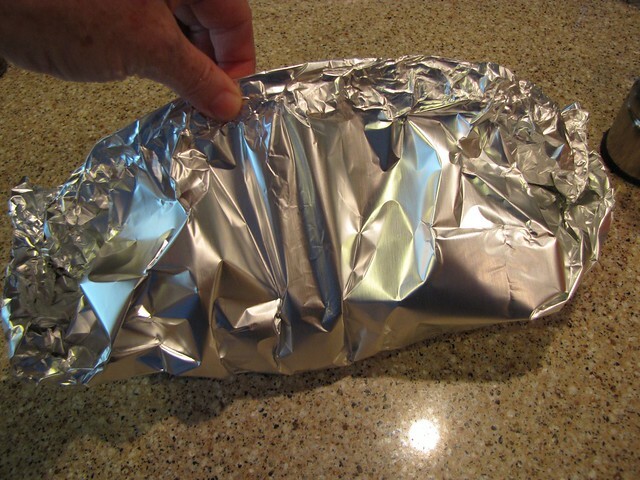 Place the foil packet in a large baking pan and cook at 350° for 2½ hours or until very tender. Be VERY careful when you open the packets or you will steam your fingers. I used tongs. 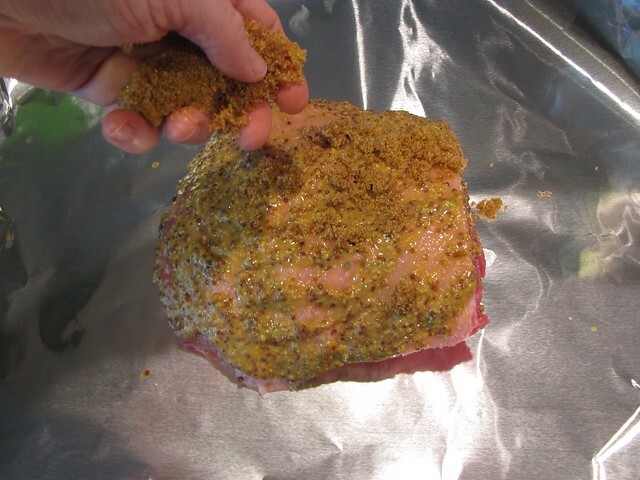 To get the crispy topping, open the foil and place the corned beef under the broiler for 2-3 minutes. 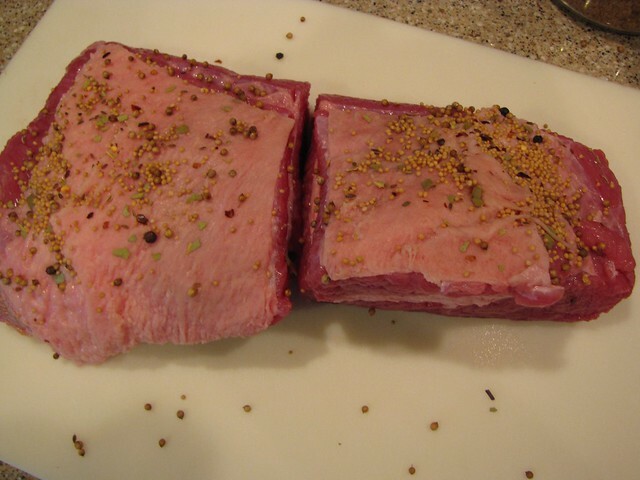 Allow the baked corned beef to rest for at least 10 minutes before slicing, then cut across the grain into thin strips. For the vegetables, you can always boil cabbage, potatoes, and carrots together on the stove top. I am going to make this again on Thursday and my plan is to bake the corned beef first then pour off the cooking liquid that is in the foil packets and put it in a pot with additional water to boil the veggies. This way, you get all of the corned beef flavor rather than plain boiled veg. When I served this last week (all in the name of scientific research) I made Smoky Roasted Potatoes and Glazed Carrots and served a broccoli/kale slaw instead of the traditional cabbage. Everyone at the table agreed that this was THE BEST Baked Corned Beef! Trust me when I tell you that you’ll want leftovers! I followed your recipe! Best Corned Beef EVER EVER EVER!!! Used to simmer mine, it was always dried out. This one was the ULTIMATE!!!! Our new way to cook a corned beef!! The mustard/brown sugar topping works its way into the meat while cooking so there is an extra flavor element not found in the traditional boiling method. And, because I already had the oven going, I put my potatoes, carrots and onions on a sheet pan and roasted them on the bottom oven rack for the last hour. They were also much more flavorful than the usual boiled variety. The cabbage was done in the microwave. Really simple overall and a definite do-over! Hi Linda – Sorry for the late reply, your comment was caught up in the spam filter. Part of why this recipe works is that the tinfoil creates a packet for the meat to steam as it bakes. I’m afraid that without that, even with a lid, the meat would dry out. The only substitution that I can think of, and I say this having NEVER tried it, is to use one of those Reynold’s oven cooking bags. Let me know if you try it. If I can still find a corned beef at my store, I’ll give it a try too. Good luck! I would best you could use a Dutch oven instead of the foil. Can’t wait. Making this tonight. I followed this recipe as written, however, I seared the fat in in really hot pan to get a nice crust on the beef. Then in my glaze I added 1/4 cup of molasses to the brown sugar and Dijon mustard. The most amazing corned beef ever! YUM! Molasses sounds like a great addition! BEST corned beef ever! This is the only way I will make it now! Thank you. je souhaite faire votre recette, mais nous ne cuisinons pas le corned beef ici en france et ma question est la suivante, quelle pièce de boeuf puis je utiliser pour suivre votre recette? nous n’avons pas de sachet “tout prêt”. Est de la poitrine de boeuf ou autre? la viande semble est persillée et gélatineuse, non? merci de votre réponse, ainsi je demanderai à mon boucher de me préparer un morceau conforme pour de bons résultats. Hello! I think you are asking for a substitute for the corned beef. I honestly have no idea. I’m not surprised that you don’t have it in France. It is a meat that has been processed/marinated in spices to make it much more tender than a regular brisket. I am asking my international friends for advice and hope to have an answer for you soon. Thank you for the comment from so far away! Hello Loty – I have some info from friends who have lived abroad that should hopefully help you to have a corned beef dinner in France. Several friends suggested that Pastrami would be a good substitute. However, most agreed that making your own is the way to go. Dave Lebovitz has a good recipe on his website. https://www.davidlebovitz.com/homemade-corned-beef-brisket-recipe/ I hope this helps! Claudia, how long should I boil the veggies now that I’m cooking the corned beef in the oven? Karen, sorry that I was gone when you asked this question but I’m glad you didn’t have to wait on me for your St. Patrick’s Day dinner! Depending on how big you chop the veggies, they take between 20-30 minutes. I love this recipe. The one thing I do is cut up all veggies and put them in the roasting pan first. I sprinkle them with olive oil, salt, pepper, and some pickling spices. Then I poured a small amount of olive oil on top and I made extra glaze and poured that on top of the veggies as well as 1 cup of chicken stock. I toss them in all of that and place the foil packets on top. That way they all cook at the same time!!!!! OOOH! What a great idea! I’ll definitely be trying this method. More sauce!!!! Just tried this for the first time. It was amazing. We also put fresh ground pepper on with the pickling seasonings before the mustard and brown sugar, but put a little mustard on the bottom of the brisket too. We cooked it in a dutch oven at 350. About 30 minutes in, we tossed in 2 quartered onions. We preboiled carrots and potatoes for about 15 minutes, then moved them to a casserole dish and added some of the juice from the corned beef and butter. The veggies and corned beef cooked simultaneously for the last hour. This is our new favorite recipe. I think we could have eaten the whole 3 pound corned beef between the 2 of us.